A few days ago I came across a very interesting juxtaposition of two myths: one ancient and one modern which perfectly captures the current situation of the American Republican party. I’d like to share it with the Ovi readership. As popularized by Sigmund Freud we are all familiar with the ancient Greek myth of Oedipus Rex which Freud utilized to elucidate the subconscious forbidden taboo desire of young men for their own mother which he claims affects all young men, consciously or unconsciously. The plot goes somewhat like this: a plague descends on Thebes; Oedipus sends his brother-in-law to the Delphic oracle to inquire about the possible cause, without realizing that the crime for which Thebes is being punished by the gods is his own: he has unwittingly married his own mother. Upon receiving this unwelcome news Oedipus plucks his own eyes out. Then there is the modern myth of Frankenstein’s monster which portrays a mad scientist creating a monster which looks like a human being but is in reality a super-intelligent robot with no consciousness, no conscience, no empathy for anybody, otherwise known as a zombie of sorts. Enter Donald Trump and the Republican party. 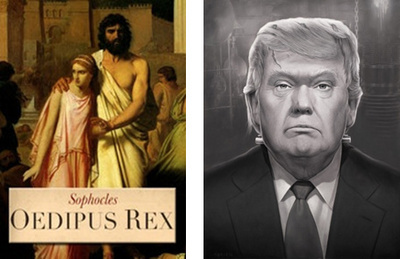 The Republican party is in fact Oedipus. A plague has descended on it and its name is Trump: the name of the most successful charlatan-demagogue in the history of US politics. The party is desperately searching for the cause and the remedy to this plague without realizing that that the plagues has been brought about by the party itself; by its own political crimes. It is cosmic justice, or perhaps poetic justice fit for a Greek tragedy. 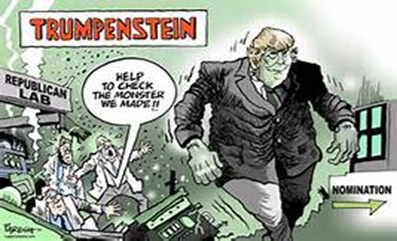 Trump is the party’s creation, just as the Frankenstein’s monster is the mad scientist’s creation, now unstoppable and coming to destroy it. It was fed by the party and now is strong enough to destroy its maker. After all, was it not the party’s insane obstructionism, the threats to shut down the government, the calls for the nullification of Supreme Court decisions, the insistence that any compromise and moderation was nothing short of betrayal, the internal coups against party leaders who refused to join the general insanity, that taught Republican voters that government, institutions, political traditions, party leadership, even parties themselves were fair game for overthrowing, evasion, insult, laughter? Sen. Ted Cruz set the disrespectful tone and now he too has been overrun by someone even more irreverent and foolhardy: Frankenstein: the purer, less ideologically encumbered anarchist-revolutionary. What an irony, the revolution devouring itself. Trump did not just happen out of nowhere, nor is he hijacking the Republican party; he is a creation of the Republican party, pure and simple. But to discover the real causes of such a bizarre phenomenon we need to dig a bit deeper. The causes can be discovered in the party’s accommodation to bigotry and racism in its ranks. The majority of Republicans are not racists, to be sure, but in some way they too have been facilitators and enablers; they ought to frankly acknowledge as much. Many of them initiated the virulent attacks on immigrants way before the Frankenstein monster arrived on the scene. How else to explain Romney’s advocacy of “self-deportation,” Marco Rubio’s abandonment of his own legislative principles on illegal immigration? How else to explain the virulent opposition and obstructionism to any legislation proposed by President Obama? So populist anger, xenophobia, bigotry, and racism were well cultivated, prepared and unleashed beforehand, thus enabling Trump to continue what they started. It degenerated eventually into mindless Islamophobia, something Trump is also proud of; into a mindless criticism of President Obama who from the beginning was branded by Trump—via his “birther” movement—as illegitimate, un-American, a subversive of American values. Trump, together with many extreme Republican politicians have merely gathered the fruits of the Tea Party movement; the standard bearer of all angry frustrated Republicans. Paradoxically, nurturing sinister forces in the party through which they had hoped to ride into power, the party leaders are now calling for a counterrevolution against Trump. They are panicking because the monster is now too powerful to be stopped and is coming to devour them and destroy their party. Not so long ago they were welcoming his contributions to a mindless debate; a debate which led 16 contenders and debaters (among whom fellow-bullies and extremists such as Christy and Cruz) to fall off the cliff of presidential candidacy. Some of them are now supporting Trump in a last desperate move to gain a modicum of power as consolation price, all in the name of patriotism and love of country, of course. The sheer hypocrisy is nauseating. It has become apparent that the Republican party is presently bent on self-destruction and perhaps cannot be saved. 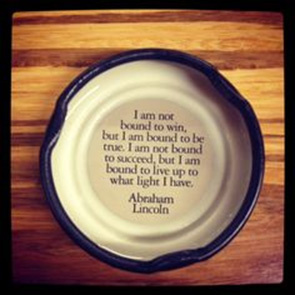 Indeed, Lincoln, who created the party, must be turning in his grave. Frankenstein will soon be let loose on the land. The crucial question at this point is this: if the Republican party of Lincoln and its ideals cannot be saved, can the country still be saved? Can a Clinton, who has her own baggage, or a Bernie Sanders, who has already been branded a Communist and a subversive, pick up the pieces and put Humpty Dumpty back together again? History will soon render its verdict.